That might be Sydney, but Brisbane this afternoon wasn't much better. 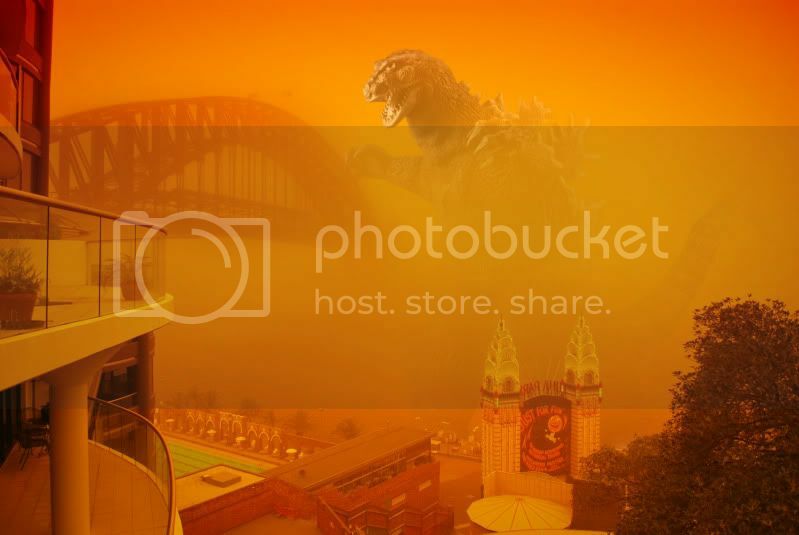 Long live Godzilla and giant red dust storms! Thankfully we didn't leave the windows wide open when we left this morning, but the one that we did... our whole kitchen floor was covered in a thin film of dust and I had to mop. The bucket was completely reddish brown. And walking outside leaves the skin feeling dry and old. It even leaves the skin smelling a bit... dusty. Yeuch...time to bathe in moisturizer? It's not the humidity that's making it feel dry. It's the dust particles - imagine your skin with a layer of fine dust... moisturiser will only make the dust stick to you more. My goodness... what the hell causes this massive discoloration? It's a red dust storm that swept in from central Australia and western New South Wales, which has almost completely covered the state of New South Wales. Brisbane had the worst of it this afternoon, but fingers crossed it'll clear tomorrow. While dust storms occur every year or so, it's been no worse than a mild haze similar to Singapore's one. Today's storm however, no one has seen the likes of since 70 years ago. Uh huh... and apparently more to come this weekend, though it's not expected to be as bad as this. Imagine a dry scratchy throat with every breath you take, a soft red hue over everything (esp cars) and having a desperate need to vaccum and mop everything. Holy crap! Didn't realise the dust storm is visible from space. Arnold: "Get yer ahss to marzzz!" Nah, I'll be fine. It's the people with respiratory health issues and asthma who have to exercise lots of caution when going outside now. Lots of photos have been circulating of the affected cities, so they prove the epicness of the event. And yes, I had to choke down a laugh at work when I saw Godzilla too. Hehehehehe... lucky for you, since this dust storm is HORRIBLE to cycle in.